Midfielder Alyssa Guzman fights for the ball in Eastfield’s Oct. 10 game against the Brookhaven Bears. The game was full of injuries and ended tied, 0-0. Photo by Yesenia Alvarado/The Et Cetera. The No. 8 ranked women’s soccer team looks to finish conference going into the final games of the regular season. The top three spots of the Metro Athletic Conference are still up for grabs, with first-placed Richland (7-1), second-placed Brookhaven (6-1-1) and third-placed Eastfield (5-2-1) all having a chance to win the regular season title. Eastfield will host Richland on Oct. 20 in the regular-season conference finale. That game will be crucial in deciding seeds for the conference tournament. The Harvesters recorded a 5-0 win over Cedar Valley College (0-8) Oct 13. Forward Arianna Dunsworth scored a hat trick and gave one assist. Goalkeeper Gabriella Roa recorded her tenth shutout of the season, putting her joint-top in the nation with Union County College’s Lauren Buchanan. 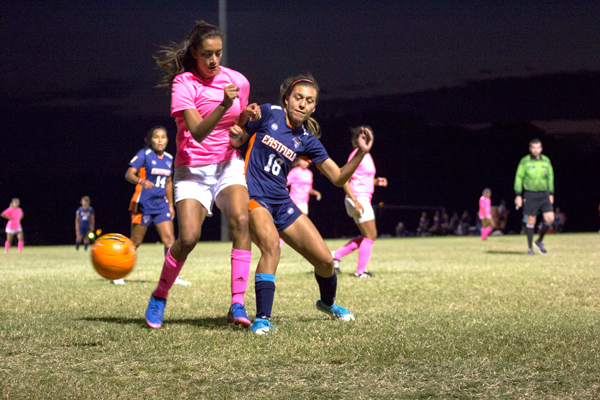 Eastfield recorded its first scoreless game of the season in a 0-0 draw against Brookhaven Oct. 10. The game was a tough and physical battle, resulting in multiple injuries on both teams. During the first rounds of conference play, the Harvesters lost 3-2 to Brookhaven and 3-1 to Richland, and Stein said the players didn’t step up in either game. During the Brookhaven game, Eastfield conceded two goals from set pieces, including the golden-goal overtime winner by the Bears. Outside factors also affected the team. During the Richland game on Oct. 3, a two-hour lightning delay halted play early in the second half with the Harvesters trailing 2-1, killing the team’s momentum as they searched for an equalizer. Stein said the delay gave their opponents the chance to recover and score a third goal, putting the game out of reach. Midfielder Emily Juarez, who leads the team with eight assists, said the Harvesters must play their best going into the last conference games but also admitted that the focus is beyond conference. “Our main focus is [making] nationals right now,” she said. Forward Yesmin Gabino said the link play between offense and defense will be crucial in order for the team to play efficiently. Defender Gloria Perez said she must be able to play the ball to both midfielders and forwards so the team can move up. “I need to see who is open and know when to play the ball forward,” she said. 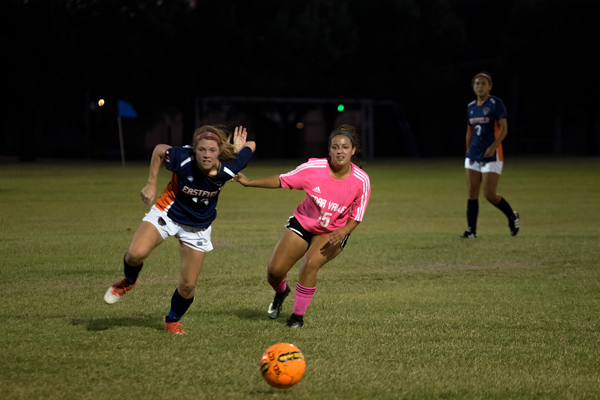 Eastfield’s defense has let in 14 goals in 19 games played, averaging 0.73 goals per game, but they have outscored their opponents with 69 goals. Forward Arianna Dunsworth leads the line with 21 goals while forward Joy Carlock has 10 goals. Stein said Eastfield’s record in conference play won’t determine the outcome in the tournament.